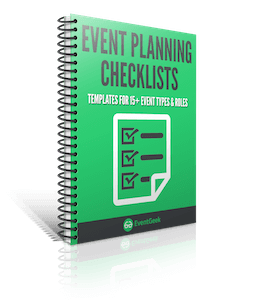 EventGeek provides a set of customizable event checklists for every major type of event, when you sign up for a free trial account. No need to reinvent the wheel. Take advantage of the experience of seasoned event planners and field marketing pros. These templates will give you a huge head start on your next event! Pick a checklist above, request a demo and get a trial account on EventGeek. You'll get to customize any of the free checklists above for your next event.